Three US DVDs are returning to the American market for a lengthly compilation boxset in the Autumn. In a theme about celebration, Carnival Capers, Thomas' Snowy Surprise and Other Adventures and Thomas' Sodor Celebration star in Celebrate with Thomas. The compilation which holds episodes from the First, Second, Fifth, Sixth, Eighth and Tenth Series runs at an aggregated 149 minutes on the three discs. The detailing reads; "Carnival Capers": Join Thomas & Friends(TM) as a carnival comes to the Island of Sodor! Also, meet new friends, Rocky and Rosie, and follow them as they explore their new surroundings and learn to work as a team with the other engines. "Snowy Surprise": On Sir Topham Hatt's railway, the winter season is a very special time of year and all the engines work extra hard to make the holidays special. But it's not always easy. Find out what could happen if the villagers on the Island of Sodor don't get their Yule tree in time for the winter celebration. See if Percy's snow-covered face tricks James and the rest of the engines into thinking they have seen the very scary Jack Frost. Watch if Duck is able to get to Farmer McColl's lambs in time to save them from being trapped in the snow. "Sodor Celebration": Let the celebration begin! Ride the rails to exciting adventures with Thomas and his friends in this collection of stories from the number 1 engine! Hop on board as Thomas learns to navigate a difficult bend on his new route - in spite of a runaway train. Watch Thomas and Percy work hard to achieve their goal of being the cleanest engines, while learning to never give up! And whether moving a circus or delivering chickens, Thomas finds that sharing the load makes things easier. 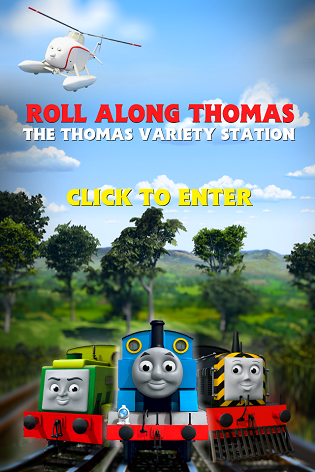 The celebration continues with more stories, more lessons and more fun from Thomas! All aboard. Celebrate with Thomas from Lionsgate Entertainment hits US DVD shelves on October 16th 2012.